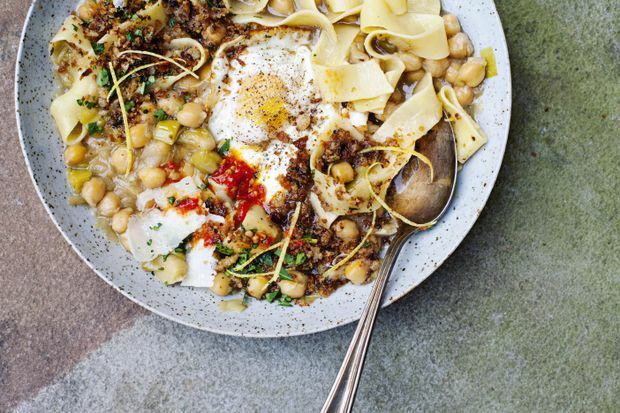 Brothy chickpeas with pasta, pangrattato and egg. Sustaining the body without taxing the spirit, this dish is a weeknight saviour that sounds fancier than it is, and it is easier to make than one might think. It’s also wildly adaptable and makes use of upboard staples. If proceeding as directed, the whole recipe is merely a matter of stewing the chickpeas, then leaving them to their own devices as their liquid reduces. But the chickpeas can be canned if you’re not moved to cook them. (With canned chickpeas, skip the simmering and proceed to reducing the stock, adding the drained legumes once the stock has thickened.) As that cooks, boil some pasta, toast the breadcrumbs to make a pangrattato, then fry eggs in the same pan. Serve, and feast. If hard pressed for time or energy, one could even forgo the pangrattato and grate on a snowfall of cheese instead. When the pangrattato is in the plan, I like fresh breadcrumbs for it. To make them, take (preferably crusty) white bread pulse in a food processor fitted with a metal blade. Do not blitz them to an even meal; here, a rustic, generously sized, uneven rubble is the aim, for all the nooks and crannies will crisp up beautifully. Since the chickpeas start with dried red chili flakes, the easiest thing to do is to also add them at the end. However, if you are lucky enough to have some pickled chilies knocking around – sliced or in paste – I urge you to use them. They give a bolder, more direct hit to the dish and are my preference. Finally, for the pasta, fresh noodles are wonderful for their silken slurp. Yet, this a pantry-celebrating recipe and that may seem antithetical to the endeavour. If you have flour in the cupboard you could make your own, but again, that’s more effort than these busy December days might allow. So, move forward with dried, with my full blessing. In the end, the bowl on the table is heartily satisfying; the noodles and chickpeas melting, draped in thickened stock, the leeks a green tangle in their company. The egg, which I like to slice into similar strips before I tuck in, is presented with an oozing yolk that enriches the stock. Chilies punctuate all with subtle fire and the pangrattato provides essential contrast. Start with the chickpeas. Warm the olive oil in large braiser or similar (you’re looking for a wide, heavy pot about 3-inches deep; a Dutch oven will do) set over medium heat. Drop in the rosemary and fry, gently stirring, until the rosemary is thoroughly crisped, about 1 minute. Remove the rosemary from the pan and set aside. Add the leeks into the pot and turn the heat down to medium-low. Cook, stirring periodically, until the leeks are bright green and starting to soften, about 5 minutes. Pop in the garlic cloves and scatter the chili flakes over all. Give a few more turns, then tumble in the chickpeas. Move the chickpeas into the oil then season lightly. Pour in 3 cups of the chicken stock and tuck in the Parmigiano Reggiano rind, if using. Bring the pot to a gentle boil over medium-high heat, then pull the heat back down to maintain a simmer. Leave to bubble slowly, partially covered, until the chickpeas are barely tender, 75 to 90 minutes. While cooking, if the stock is ever lower than the level of the chickpeas, add top up with the remaining cup, or use water. When the chickpeas are al dente, retrieve the Parmigiano rind. Remove the lid completely, give the legumes a gentle stir and raise the heat to medium. Allow the liquid in the pot to reduce by a scant half, at which point it should glossily cling to the chickpeas, about 15 minutes more. Check for seasoning and keep warm if needed. While the stock reduces, cook the pasta a minute less than package directions. Make the pangrattato, heat the olive oil and anchovy fillets in a large, heavy-bottomed skillet over medium heat. Smush the fillets to a murky pulp with the back of a spoon and fry until melted, 30 seconds. Tumble in the bread and fry until golden and only starting to brown, about 5 minutes. Stir in the garlic and stir for 30 seconds more. Pull from the heat, fold in the parsley and lemon zest. Transfer the pangrattato to a bowl and wipe out the pan. Pour in enough oil to thinly coat the bottom of the pan. Crack in the eggs, season, and fry to your liking, but my recommendation is sunny-side up, or over easy. Right before serving, stir the pasta into the chickpeas. Decant to serving dishes, then top each plate with the pangrattato, an egg, Parmigiano shavings and dried chiles. Garnish with the fried rosemary and anoint with olive oil. Eat.